Arsenal booked their place in the hat for the FA Cup fifth round draw after beating Burnley 2-1 at the Emirates Stadium on Saturday afternoon. Calum Chambers put us ahead with a stunner before Sam Vokes equalider midway through the first half for Burnley. However, Alexis Sanchez won it shortly after half-time with a smart finish to book our place in the fifth round draw. Ospina 6.5/10 | Made a vital early save to deny Gray and was quick off his line throughout the game. Could perhaps have come to collect the cross that led to the equaliser though. Chambers 7/10 | Superb finish to make it 1-0 and was a solid deputy at right-back in place of the rested Hector Bellerin. Gabriel 7/10 | Used his pace to good effect to shackle the dangerous Gray up front but should have done better for the Vokes headed goal. Koscielny 6.5/10 | Got away with an early mistake which could have cost us a goal. Improved as the game went on. Gibbs 6.5/10 | Partially at fault for their equaliser as he wandered out of position but was a threat going forward. Coquelin 7/10 | Solid return for the Frenchman. Is going to be a key player during the second half of the season. Elneny 7.5/10 | Very encouraging debut playing in the box-to-box role. Loves a long range shot and was sensible while in possession. Iwobi 7/10 | Lively performance from the youngster. Showed great maturity in his game and played a role in both goals. 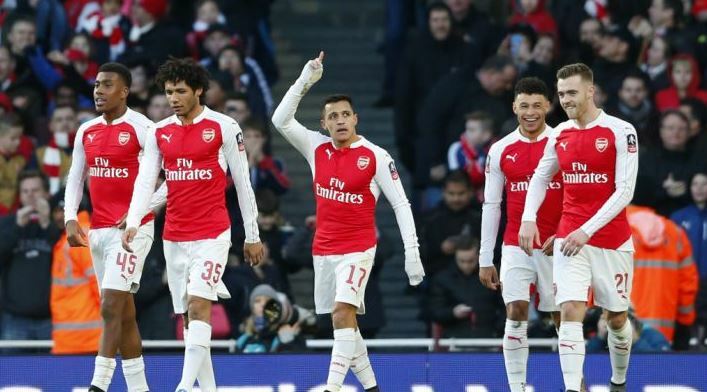 Oxlade-Chamberlain 6.5/10 | Got the assist for Sanchez’s winner but his final ball was largely disappointing. Held on to the ball for too long at times. Alexis 8/10 | Back in the starting eleven and was the best player on the pitch. Grabbed the winner but his overall game was excellent. Giroud 6/10 | Not involved enough. Only impact was a few decent touches to link up play. Not a threat in front of goal at all. Arteta (5), Rosicky (5), Walcott (5). It wasn’t vintage Arsenal and we made life difficult for ourselves but we’re through to the fifth round and that’s all that matters. Let’s hope for a favourable draw…. Arsenal has done a very great job so your hard working will never led you down.